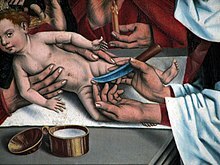 The Circumcision of Jesus is an event from the life of Jesus according to the Gospel of Luke, which states in verse 2:21 that Jesus was circumcised eight days after his birth(traditionally January 1). This is in keeping with the Jewish law which holds that males should be circumcised eight days after birth during a Brit milah ceremony, at which they are also given their name. The circumcision of Christ became a very common subject inChristian art from the 10th century onwards, one of numerous events in the Life of Christ to be frequently depicted by artists. 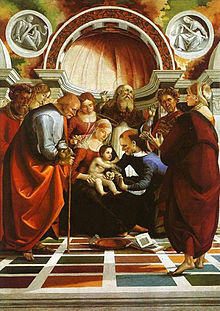 It was initially seen only as a scene in larger cycles, but by the Renaissance might be treated as an individual subject for a painting, or form the main subject in an altarpiece. The event is celebrated as the Feast of the Circumcision in the Eastern Orthodox Churchon January 1 in whichever calendar is used, and is also celebrated on the same day by many Anglicans. It is celebrated by Roman Catholics as the Feast of the Holy Name of Jesus, in recent years on January 3 as an Optional Memorial, though it was for long celebrated on January 1, as some other churches still do. A number of relics claiming to be the Holy Prepuce, the foreskin of Jesus, have surfaced.